This is what I call a precautionary or Boogie Man video. This one being the most famous when it comes to edged weapons. It features Dan Inosanto, a student of Bruce Lee and Filipino martial arts master attacking police officers with an edged weapon. First, watch the video all the way through, even if you have seen it before. Remember all you can. First of all the video is dated, but that does not mean it does not have merit. It says in the beginning that it is unscripted. Well the poor SOBs that either volunteered or were voluntold to be involved in this knew a couple of things. First, they were stripped of their live ammo and weapon and who knows whatever commonly carried tools before being put in the scenario. Neither they or the suspect was wearing pads or any other protective gear and the scenario was done with hard walls and floor. By the switching out of the pistol, they were more or less instructed that the pistol was likely to be the force option at play. As in-service police, all of these officers had been involved in training involving drills and scenarios before and nobody likes to lose or look like an idiot. This is why they all have their hand on their pistol even during initial contact which pretty much makes it a given that they will draw their pistol in response to furtive movement, even if they do not see a weapon. A simple metaphor for this would be that they already have a 1/2 wrench in their hand without knowing what size they need. The problem is that a wrench will not help them, they are thumb screws. The tool already in their hand is more of a hindrance than a help. Even though the lighting conditions seem to be good, there is little to no chance that the officers involved would be truthful if they said they saw the weapon. They already had their hands on their gun and attempted to draw in response to the suspect rushing them. If he had a knife they could not see, they now took their strong hand essentially out of the fight because muscles contract under stress, which means that there was little chance they would break that hand free to fight once it is already involved in carrying out their initial response which was drawing their gun. If he does not have a knife, they are drawing a gun on an unarmed man and will be likely putting themselves in a situation where they may use an inappropriate level of force because it is already in their hand. The video does say that you need open hand skills in this situation. 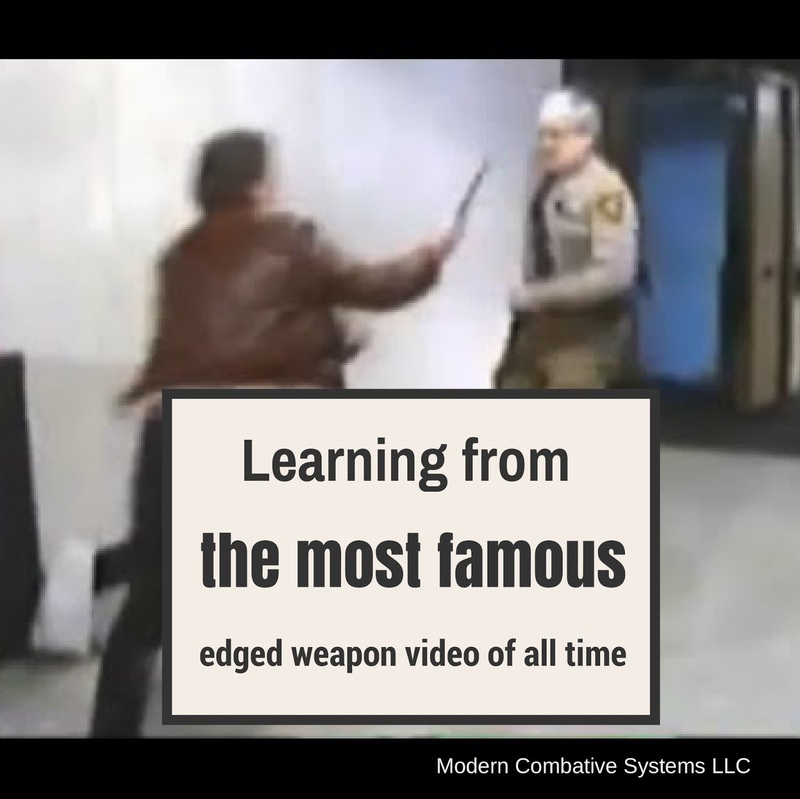 The problem is that even though this video is dated the time police spend on firearms training vs open hand skills, much less actually combatives, is pretty lopsided. 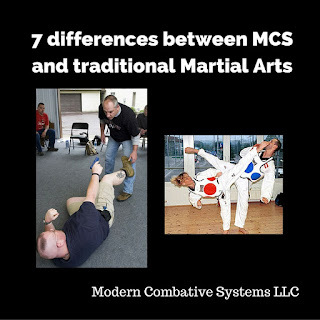 Defensive tactics courses produce more loss time injuries for police than firearms training, so they are limited in their realism, if they had any to begin with. Sadly, many are just watered down arrest and control instead of arrest out of control. Also, your OC and Taser will not help you in these situations. Police need to know how to fight. You can see the strong reliance on traditional firearms skills when the officers approach. They are very bladed with their pistol away from the suspect. It also looks like most were probably Weaver shooters. As soon as they are stationary and that hand is on the gun, the outcome is predictable, whether or not the suspect had an edged weapon or not. With their strong side back, they are mentally and physically locked into moving straight back and as you can see banging into to things or in the real world falling backwards over curbs or their own feet. They back peddled due to being rushed, not from the sight of a weapon. Everything to their left, their attacker's right, disappears. You need to move in sharply to their left. This is their non reaction side which makes it harder for them to track you. I realize it is counter intuitive, but the only way to survive an ambush is to counter attack it, and remember what you probably will see is a guy rushing you, not a guy with a knife. Gun guys are trapped on this GAIN DISTANCE thing. If you are Tactical Teddy and your back is always against the wall, where exactly are you going to get this distance from? Stop looking to gain distance in a fight, especially if you cannot see a weapon. 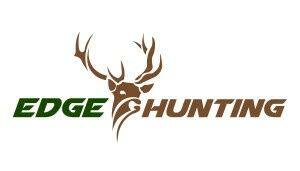 By gaining distance, the only thing you are doing is giving them the time and space needed to deploy a weapon. Instead, be looking for physical barriers, anything to put between you and them. But stop back peddling, you only own the ground you can see in front of you. Now let's talk about those I keep seeing on the interwebs whose neighbor's brother in law's buddy is a US Marshal and he says that 21 feet, or 30 feet are not enough and they are changing it to 45.667. The weapon stand off is a fantasy, one that is quite popular. The fantasy is a stationary suspect standing with an exposed edged weapon at a distance allowing you to draw your pistol and issue verbal commands. With the exception of firearms, all weapons, personal, impact, and edged require the suspect to touch you. That means getting close to you by using a guise or close enough for them to rush and overwhelm you. So when involved in your when/then not if/when scenarios in your head, they better happen at conversation distance and that is what you better be training for. At the end of the video they make a statement to the effect that 21 feet is needed to get rounds COM on the attacker. My question always is what mechanical effect will those rounds have against someone rushing you at full speed? If in exchange for those rounds you stand your ground and have a guy who is dead but does not know it yet stab you in the chest....who wins? What will save your life at the close distances from others where we live our lives is violence of actions. Unless you have a reason not to, move forward towards their left, to their outside, attack their head, elbows, and knees as needed. You might not know there was a weapon involved until they drop it or you feel it after it is all over. Don't let your defense be predicated on seeing a weapon.